PORTEmaus: A Fantastic Correlation Between the Rise of Modern Fascism and the Formula Used by Infants. A Fantastic Correlation Between the Rise of Modern Fascism and the Formula Used by Infants. I cannot for the life of me understand the market for baby magazines. The mediocre quality of the magazines showcasing altogether vapid stories about this or that 40 some odd year old CBS journalist (see American Baby folks) with a bad face lift or such fluff pieces as "Is your baby gay?" tend to give one acid reflux. The sad fact is that I wish I was making this up, but sadly this is the climate for not only future parents but our nation as a whole. Moreover, for the 10 pages of stories like "Nap times recharge baby's batteries," there are 30 pages of advertisements for the usual cavalcade of diapers, formulas and talcum powders. It was in these 30 pages that I unearthed a disturbing trend. Baby Magazines are promoting the rebirth of the once vanquished foe of Fascism. (Much like Tuberculosis or Sarah Palin its making a comeback) After seeing this magazine in various nooks in my house, I decided to take a gander at it. Foremost, the magazine itself exhibits a blatant nationalistic fervor --not surprising being named American Baby and all. It begs the question, what's the difference between an American baby and others born elsewhere? That's right, access to basic medicines, medical support and a low infant mortality rate, but I digress--, while showcasing predominately blond haired white children with the occasional ginger with a goofy grin, I began to notice coincidences, namely all of the children were male with a distinct hair style (Combed over to the side). 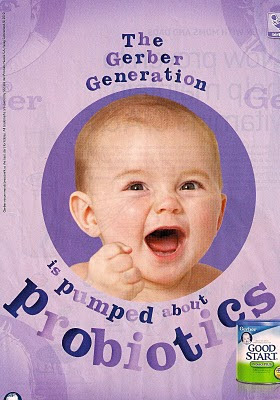 As I continued to look through the magazine, I came across an a Gerber advertisement that put the whole thing in perspective... The Gerber ad smacked of Fascist propaganda. Locks of blond hair... Light eyes... Snarl of hate on his lips with his right fist raised at an unknown enemy, all the markings of the hypothetical German Übermensch. At this point, I could not help but recoil in horror with visions of stormtrooper boots on cobbles, Stuka dive bombers leveling villages, innocents being murdered in the streets and Il Duce being hung by his feet running through my head. I summoned all of my courage and threw the magazine across the room in disgust. I hereby alert the four people reading this that none of my children (soon to be born or future conceived) will neither consume nor use Gerber products. 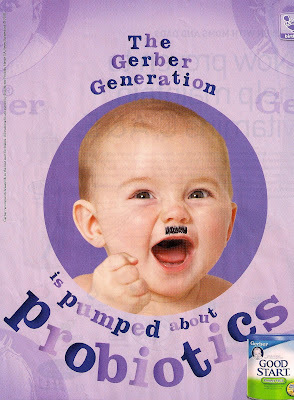 They (Gerber) can spread their message of master-race children and hate elsewhere. Its store brand goods for the Funkowitz children! So, if you ever find Junior breaking windows and uttering racial epithets in German... It looks like you have a Nazi on your hands and it could be attributed to the formula you use.